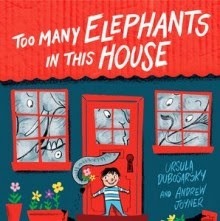 Too Many Elephants in this House was written by Ursula Dubosarsky, illustrated by Andrew Joyner and published by Penguin Group Australia, 2012. It has the distinction of being chosen as the book to be shared across Australia for for National Simultaneous Storytime 2014. I’ll have activities you might like to use to extend the literature experience for Too Many Elephants in this House in my post, Resources for National Simultaneous Storytime, 2014. I can see immediately why this charming children’s picture book has been chosen for NSS on May 21. Kids will LOVE this story! The combination of Dubosarsky and Joyner is an inspired one, each bringing an exciting dimension to the book. Dubosarsky is such a skilled writer, knowing what to include to tickle children’s imaginations, but also knowing what to leave out. In Too Many Elephants in this House, she has given us a joyful celebration of childhood and the power of imagination. Joyner brings in his own vision of multiple elephants, each with its own personality, and a happy young hero who is nevertheless determined to retain his pachydermic pals. The strong lines and careful use of colour and pattern contribute to lots of movement and excitement in the illustrations. Too Many Elephants in this House is also a testament to the best children’s toy of all - the cardboard box! What a great book to follow up with kids by giving them a supply of boxes and letting them get on with it. Let children explore ways of constructing and decorating with cardboard. Vehicles, cities, cubbies and even elephant houses will arise before your eyes. Find many more ideas for teachers, librarians and parents to use with this book with children on Friday.